(1) Talks between the U.S.and China to reach a settlement following the imposition of bilateral duties on $360 billion of trade in the second half of 2018 are set to begin on Jan. 7, Bloomberg reports. That follows a positive phone call between President Xi Jinping and President Donald Trump, reported by the Financial Times. (2) While the talks are only being held at the sub-ministerial level there are already clear signs of movement – at least on the Chinese side – to accommodate U.S. demands regarding intellectual property practices. The recent Central Economic Work Council – as well as providing for economic reflation exemplified by the tariff reductions outlined in Panjiva research of Jan. 2 – has outlined plans to increase foreign investor access to the market as well as establishing new rules for intellectual property rights. The latter includes moving the ultimate arbiter for cases to the Supreme Court from just regional courts according to Xinhua. (3) In the shorter-term the process may be further aided by a continued provision of commodity export “wins” for the Trump administration. The most recent is the approval by the Chinese government for U.S. exports of rice reported by Reuters. 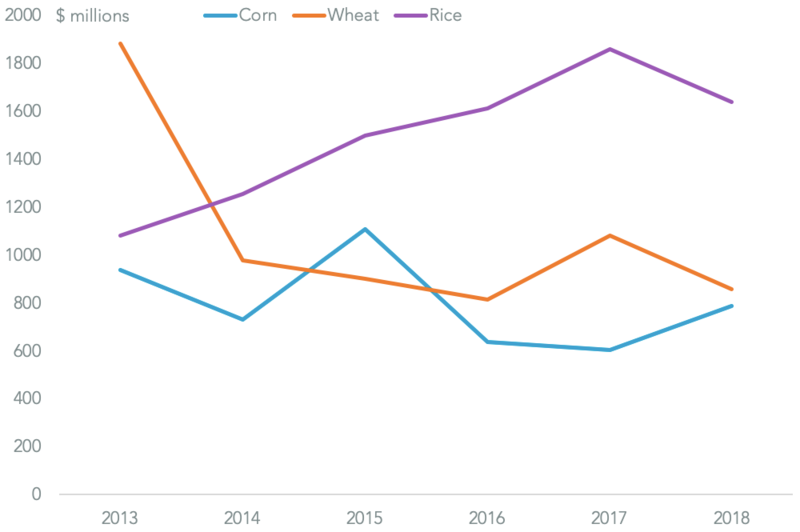 The latter comes at an opportune time given U.S. exports of rice fell 23.6% on a year earlier in the 12 months to Oct. 31, Panjiva data shows. 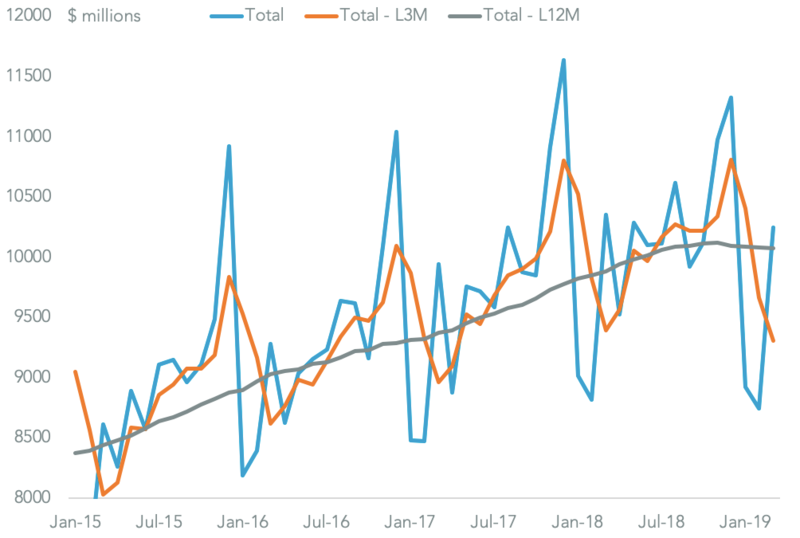 Total U.S. exports of 3.04 million tons compares to Chinese imports of 30.5 million tons in the 12 months to Nov. 30, Panjiva analysis of official data shows. (4) The U.S. government shutdown, caused by disagreements between the Trump administration and Congress over funding for border security, has led the White House to threaten once again to close the border with Mexico. Indeed, President Trump has suggest it may be “profit making” to do so despite the risk of significant disruption to industrial supply chains. Notably the shutdown has also delayed the publication of the latest U.S. trade statistics by the Commerce Department. (5) The administration also retains a hawkish stance regarding automotive tariffs with Commerce Secretary Wilbur Ross flagging that the administration has “a lot of flexibility” with regards to the section 232 review of the industry in an interview with the Financial Times. That comes ahead of the Feb. 17 deadline for the publication of the Commerce Department’s report on the topic – which could potentially be delayed by the shutdown. 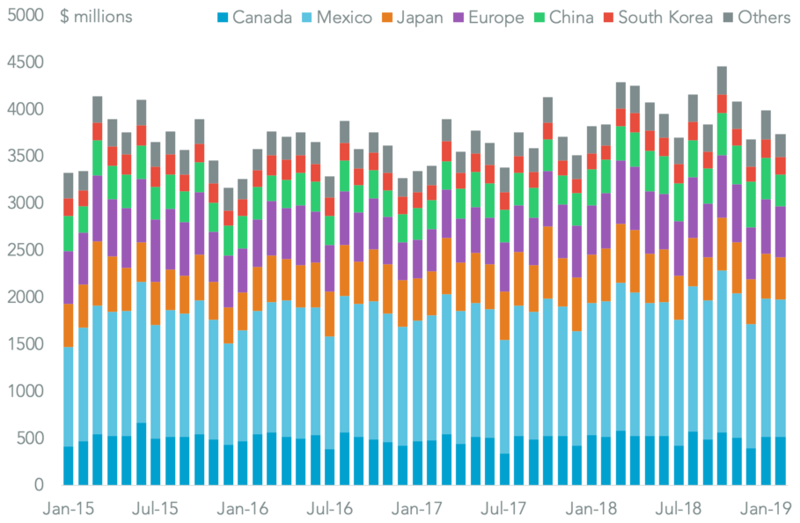 Uncertainty over the report’s outcome may be driving an increase in imports of automotive parts with seaborne imports having increased by 12.9% on a year earlier in the fourth quarter based on preliminary data. (6) The recommendations of the report and President Trump’s policy actions that need to be concluded within 90 days may also put America’s trade negotiations with Japan and the EU at risk given the importance of each to U.S. automotive imports. The negotiating objectives published by the U.S. Trade Representative include improved access to the Japanese autos market. (7) The Comprehensive and Progressive Agreement for Trans-Pacific Partnership (CPTPP) came into effect from Dec. 30, cutting tariffs across Australia, Canada, Japan, Mexico, New Zealand and Singapore while Vietnam will join on Jan. 14. The completion of the CPTPP in 2018 was one of the major success stories for global trade policy, though four of the members have yet to formally ratify the document. 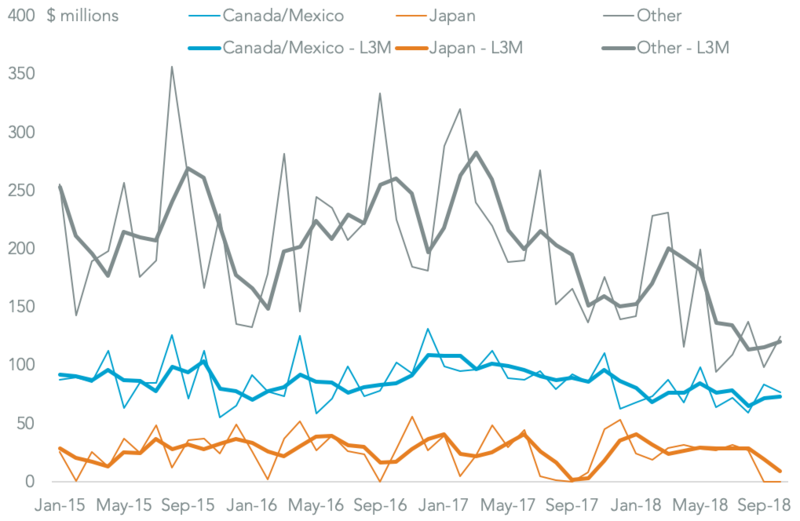 (8) The cuts in tariffs may help boost regional trade activity, particularly between Japan and Canada / Mexico. 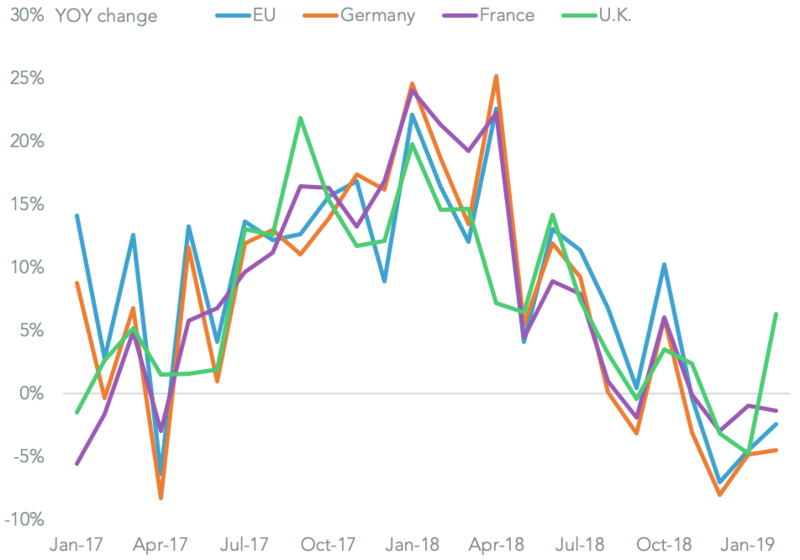 While global trade activity remains robust – global trade expanded for a 33rd straight month in October, Panjiva analysis of CPB World Monitor data shows – there are signs of a slowdown in places. 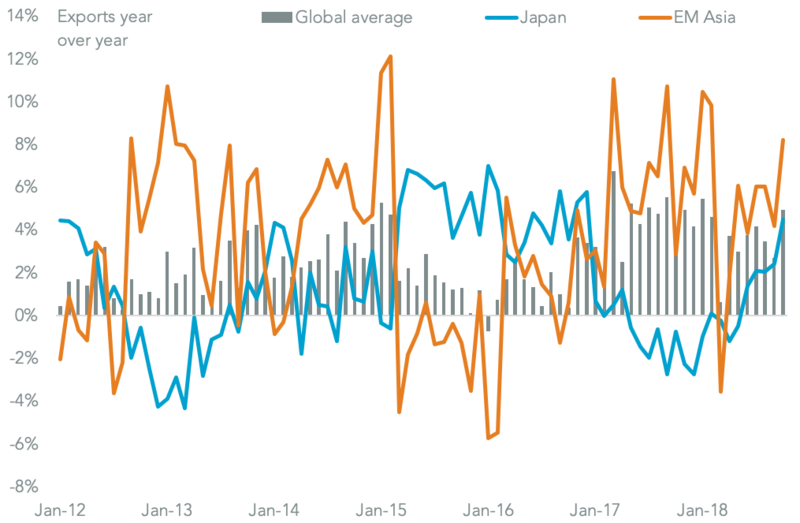 Japan – as well as China and India among others – saw slowing export growth in November. (9) A further slowdown can be seen from preliminary export data from South Korea for December which saw a decline of 1.2% on a year earlier, compared to an average 6.0% rate in the prior three months. 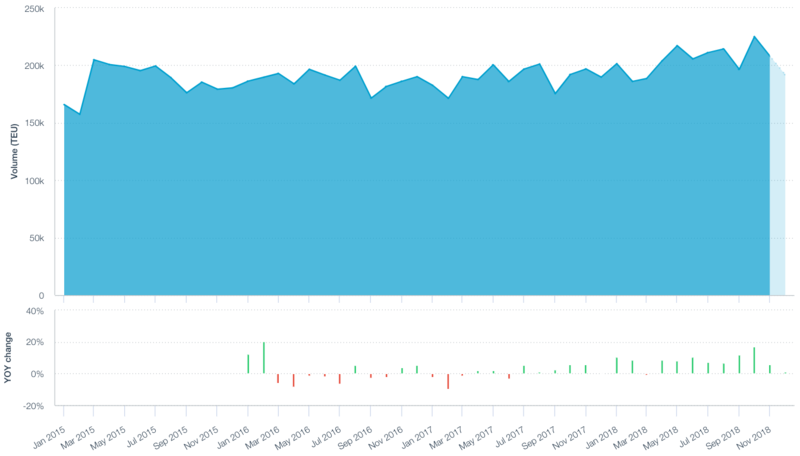 The recent collapse in oil prices will lead to an exaggerated slowdown in trade given they were 16.0% lower in December 2018 than in December 2017, S&P Global Market Intelligence shows. (10) A potential slowdown in Transpacific freight can already be seen in shipping rates. The largest route for China-to-U.S. West Coast routes fell by 10.8% at the end of December vs. the end of November, dragging global rates down by 2.6% overall, Panjiva analysis of Shanghai Shipping Exchange data shows. (11) That hasn’t fully sorted out prior congestion issues for the industry though. The Pacific Merchant Shipping Association has highlighted concerns about rising dwell times, particularly in California, resulting from the surge in shipping designed to beat tariffs, American Shipper reports. 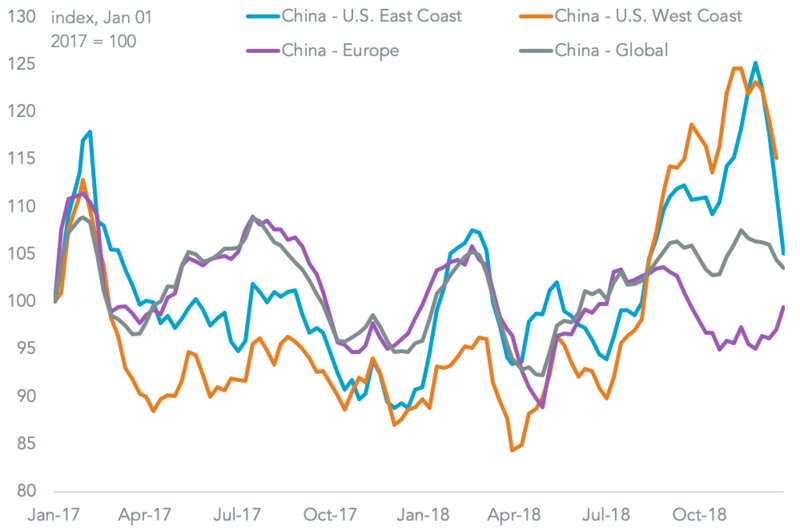 (12) The drop in container-rates was outstripped by a slide in bunker fuel costs, which dropped 14.4% at the end of December vs. the end of November according to S&P Global Platts data, which should mitigate the impact on the container-lines’ profitability. The new year may also bring further strategic action from the liners to improve profits in the longer-term. One trend that is likely to persist is the integration of the liners by acquisition. Maersk’s CEO, Soren Skou, has stated that the company is looking for “land-side” acquisitions to continued the group’s restructuring. CMA-CGM’s investment in Ceva Logistics will also proceed further in the new year.